This guide will help you find books, videos, articles and websites about welding technology. Use the tabs below and the menus on your right to start searching for different types of materials. This database is a cross-searchable collection of electronic books covering many subjects in technology, engineering, applied technology, science, chemistry and physics and much more. This collection contains a large selection of materials about Welding Technology. To browse all of these titles, choose "Browse" and look for "Welding Engineering & Materials Joining" on the Subject page. This website contains the full-text of the AWS standards. Students have read-only access to this content. Please see your instructor or a librarian if you'd like to print/download the standards. Refer to this guide for help accessing the AWS site. Videos in the Library are available to both students and faculty. Students can check out most of the Library videos but sometimes they have to be used in the Library. If you would like to take a reserved video home, please contact the Welding Librarian to get permission for a brief loan. When you are in the Library catalog, do a search. (Ex. Welding) You can choose to limit the search to a specific video format: VHS, DVD, or eVideo (streaming). This collection of online streaming videos includes a variety of subjects related to Welding and Materials Joining. Look for the category: Building & Technical Trades: Welding. Associates Programs Source Plus is designed specifically for junior & community colleges with a primary focus on disciplines of study within associate degrees and certification programs. Areas explored include accounting, agricultural sciences, child care services, cosmetology, culinary arts, forestry, food service management, graphic arts, hair dressing, hospitality management, interior design, journalism, plumbing, heating & air conditioning, veterinary technology and welding. 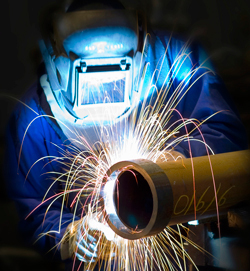 For a complete list of databases for Welding topics, go to: the Welding Databases page. It is best to search for materials on the Internet using tight, refined searches. Remember there are many specialized search tools you can use and also remember to carefully evaluate any information you find on the web.